If the "green' in "greenway' is read as "environmentally pleasant' then "greenway' is a valuable portmanteau term. But "greenways' come in many colours and varieties, which must be fitted into the environment as carefully as the parts of a mechanical clock. Each must be adapted to its location and to its role within the urban structure. This demands a qualitative approach to open space planning. Building upon the methodology of pattern-assisted design, greenway types can be explained as archetypal patterns. In the following pattern descriptions, there are upward and downward links to Alexander's Pattern Language, with short statements of "problem and solution' used in place of full pattern descriptions. 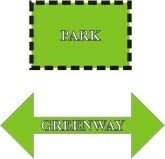 This has been done in an attempt to apply Alexander's Pattern Language approach to greenway and open space planning. Spirit Quay. This apparently excellent greenway is near Tower Bridge in London. It is hardly used because it does not follow a route which people want to travel along (from Hermitage Basin to Shadwell Basin).